Jet Airways (Mumbai) is getting out of the low-fare business and will concentrate on full service flights under its own brand. All JetKonnect-branded flights will end on November 30 and on the following day all flights will be operated under Jet Airways brand. JetKonnect (Mumbai) was originally known as Sahara Airlines which started operations on December 3, 1993. The airline changed its name to Air Sahara on October 2, 2000. Jet Airways acquired the airline and changed its name to Jetlite on June 1, 2007. Jetlite was replaced and merged into Jet Airways’s JetKonnect brand on March 25, 2012. From December 1, 2014 all existing JetKonnect flights will operate as full service flights under a single brand, Jet Airways. All guests booking flights on or after September 15, 2014 for travel on or after December 1, 2014 will enjoy a full service experience onboard all Jet Airways and JetKonnect operated flights across our domestic network. This enhancement will involve complimentary meal service onboard all our flights for travel effective December 01, 2014. Consequently Sky Café, our Buy on Board service will be discontinued. JetKonnect flies to 47 cities within India with over 430 daily flights with a mix of Boeing and ATR aircraft. Copyright Photo: Eurospot. Jet Airways retained the Jetlite color scheme and simply added JetKonnect titles when the two brands were merged. ATR 72-212A (ATR 72-600) F-WWEQ (msn 1056) descends from the clouds at an overcast Toulouse. F-WWEO became VT-JCX on delivery on November 30, 2012. This entry was posted in Air Sahara, Jet Airways, JetKonnect, Jetlite, Sahara Airlines and tagged 1056, Air Sahara, ATR, ATR 72, ATR 72-212A, ATR 72-600, F-WWEQ, Jet Airways, JetKonnect, Jetlite, Sahara Airlines, TLS, Toulouse, VT-JCX on November 7, 2014 by Bruce Drum. Jet Airways (Mumbai) will retire the Jetlite brand on March 25. Jetlite operates 19 Boeing 737 aircraft. As part of a strategic rebranding exercise, Jet Airways, India’s premier international airline, will consolidate its low fare service products under the JetKonnect brand to simplify the group’s service proposition and enhance brand recall. Thus, effective March 25, the erstwhile JetLite and Jet Airways Konnect services will operate under the JetKonnect brand, enabling guests to avail of a single superior in-flight product in the full service (Jet Airways) and low-fare (JetKonnect) categories. Jet Airways (India) Limited and JetLite (India) Limited, will continue as distinct business entities operating under their own airline operating permits. All low-fare operations will be consolidated under the JetKonnect brand. The Jetlite aircraft will be repainted in the brand of JetKonnect. 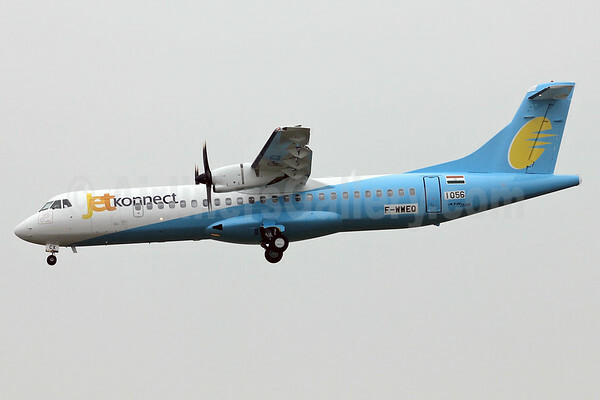 “In an attempt to achieve brand consistency, JetKonnect will be the dedicated low fare service with a mixed fleet of Boeings and ATR aircraft to operate on metro, tier II and III routes. The aircraft will be duly painted in JetKonnect colours over time. JetKonnect will offer Premiere services on certain routes where guests may enjoy service identical to that enjoyed by Premiere guests on Jet Airways. This will be further expanded in a phased manner. The cockpit and cabin crew will don the same uniform as their counterparts from Jet Airways. Some JetKonnect flights will operate under the S2 code, while others will have flight numbers prefixed by the 9W code. 9W and S2 will also continue their existing Codeshare agreement enabling guests to enjoy seamless connectivity between India and the world. A gradual rebranding of the JetKonnect brand would be manifest on letterheads, the JetKonnect website, boarding passes, tickets, stationery. Signages at all check-in and ticketing counters will have dual branding reflecting the existing Jet Airways and the new JetKonnect logos. Difference in fares between the premier Jet Airways and JetKonnect will also be reflected on the website and all visible communication avenues. Economy guests onboard JetKonnect flights will continue to be offered a range of refreshments from Jet Cafe, JetKonnect’s buy-on-board meal service. This entry was posted in Jet Airways, JetKonnect, Jetlite and tagged Jet Airways, JetKonnect, Jetlite on March 19, 2012 by Bruce Drum. Jetlite Boeing 737-8Q8 WL VT-SJH (msn 30695) BOM (Ton Jochems), originally uploaded by Airliners Gallery. Jet Airways (Mumbai) intends to merge the low-fare, no-frills Jetlite subsidiary into the two-class Jet Connect subsidiary. As a result the pictured Jetlite brand and service will be retired according to this article by Business Standard. Jetlite currently operates 10 Boeing 737-700s and nine 737-800s. This entry was posted in Jet Airways, Jet Connect, Jetlite and tagged Jet Airways, Jet Connect, Jetlite on January 7, 2012 by Bruce Drum. Jet Airways (Mumbai) (a Boeing customer from the start) intends to lease more than 10 Airbus A320s to replace subsidiary Jetlite’s Boeing fleet according to this report by The Economic Times. Jetlite currently operates nine 737-700s and nine 737-800s. This entry was posted in Jet Airways, Jetlite and tagged Jet Airways, Jetlite on December 2, 2011 by Bruce Drum. Jet AIrways (Mumbai) intends to loan its Jetlite (Mumbai) subsidiary $9.6 million by the end of March 2012 to keep the loss-making airline flying according to this report by the WSJ. This entry was posted in Jet Airways, Jetlite and tagged Jet Airways, Jetlite on November 27, 2011 by Bruce Drum. Jetlite (Delhi) aircraft hit a bird on takeoff at Kolkata yesterday (November 17) and it safely returned to the airport. This entry was posted in Jetlite and tagged Jetlite on November 18, 2009 by Bruce Drum. Jet Airways (Jet Airways India Limited) (Mumbai) eventually intends to merge its two low-cost subsidiaries once the on-going legal dispute with Sahara India is ended. 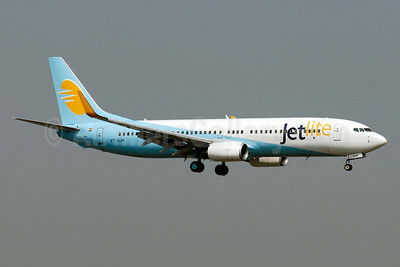 JetLite (formerly Air Sahara) (Delhi) was acquired by Jet Airways on April 12, 2007 for approximately $342 million. JetLite will be merged with Jet Airways Konnect (Mumbai) which Jet Airways launched on May 9, 2009 with two Boeing 737-800s and six ATR 72-500s. The only difference with Jet Airways (besides the lower fares) is passengers on Konnect must purchase any on-board meals. Sahara India has taken Jet Airways to the Mumbai High Court claiming the latter defaulted on the progressive payments for the Air Sahara. This entry was posted in Uncategorized and tagged Jet Airways, Jet Airways Konnect, Jetlite on July 29, 2009 by Bruce Drum.